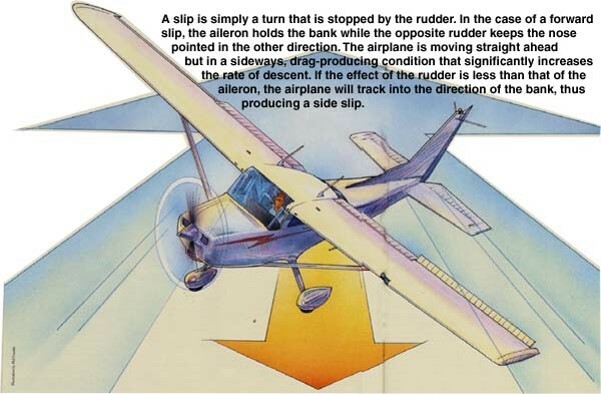 Slipping is a manoeuvre in which the aircraft is placed in a banked attitude but its tendency to turn is either reduced or prevented by the use of rudder. Entry, practical use and recovery from different slips. This technique it’s important for landing with crosswind. How do you maintain a coordinated flight ? What is the main difference from a spin and spiral? If you apply left rudder, which way would the nose of the aircraft point ? 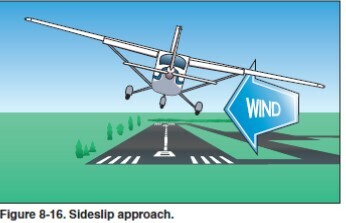 Side-Slip (regular slip): used for crosswind landings. Forward slip: used to lose extra height. (Needed during flap failure for instance). Slipping Turn: used to lose extra height while in a descending turn. 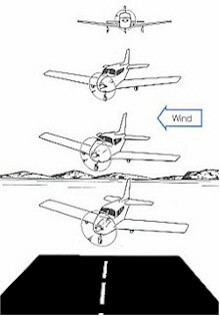 Side-slip purpose is to counteract the effect of drift when landing in a cross-wind. In a sideslip, the airplane’s longitudinal axis remains parallel to the original flight path. The steeper the bank—the greater the degree of slip. As bank angle is increased, additional opposite rudder is required to prevent turning. Use ailerons to bank the airplane in the direction of the wind. At the same time use opposite rudder to maintain the airplane’s longitudinal axis parallel to the original flight path. Use elevator to control approach speed. Use power to control rate of descent while on approach to landing. The drift is controlled with aileron, and the heading with rudder. Anticipate control pressure when maintaining a slip. If full rudder is used, considerable aileron pressure may be needed to maintain the bank. Adjusting pitch to resume normal descend and attitude. The forward slip will change the heading (longitudinal axis) of the aircraft away from the down wing, while retaining the original track (flight path over the ground) of the aircraft. A forward-slip is useful when a pilot has set up for a landing approach with excessive height or must descend steeply beyond a tree line to touchdown near the start of a short runway. 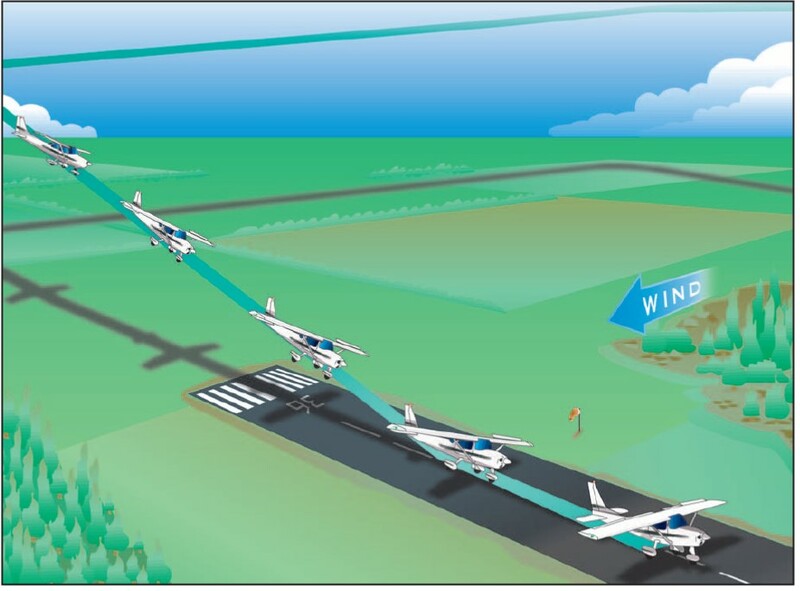 Assuming that the runway is properly lined up, the forward slip will allow the aircraft track to be maintained while steepening the descent without adding excessive airspeed. Since the heading (or longitudinal axis) is not aligned with the runway, the slip must be removed before touchdown to avoid excessive side loading on the landing gear. Power to idle to increase the rate of descent. At the same time, apply opposite rudder to keep the plane from turning on the lowered wing. Pitch: To prevent the airspeed from increasing, raise the nose slightly above the normal gliding position. In the same time release rudder pressure. Level the wing and adjust the pitch attitude. A slipping turn uses the same procedure as forward slip (increased the rate of descent without increasing airspeed) but does this in turn. The turn is slowed, but not prevented, by the use of opposite rudder. The slipping turn can be useful during a turn to final approach, especially in the case of a forced landing in which excess altitude must be lost. Bank in the direction of control column deflection. *Because of the location of the pitot tube and static vents, airspeed indicators in some airplanes may have considerable error when the airplane is in a slip. What’s the procedure for entry and recovery from a side-slip? What are the 3 types of slip ? In a sideslip, does the airspeed indicator over-read or under-read ?